If you can't lay your hands on one of those one-pound candy box, use Auntie Andrea's box template, which can be found here to make your own. You should preferably make your box out of cardstock or thick cardboard. To keep your box from getting grease marks, also cut out the design in parchment paper, waxed paper or foil and put that layer inside your box. You can use an dry-adhesive dispenser (the roll-on glue used for scrapbooking) or a glue stick to assemble the box and to glue the 2 layers together. 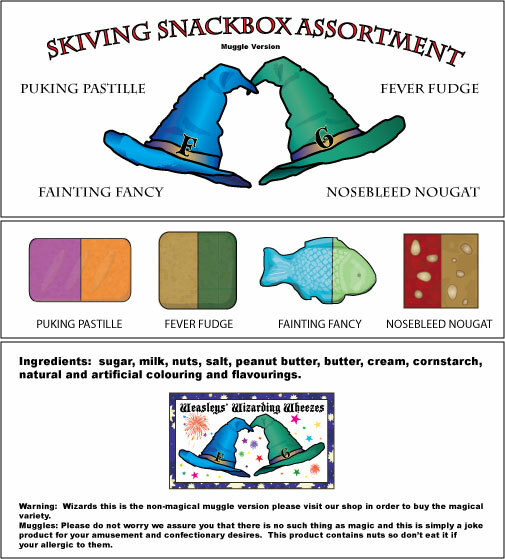 Use a color printer to print out the design page the author designed for the snackbox. To get the best looking box print on sticker or label paper, but if it is out of your budget regular paper would be fine. Assemble the box (the package explains how to fold it). Cut the designs out and attach them to the box. If you use regular paper you will have to use a glue stick to attach the designs to the box. The last step is to wrap the candies in waxed paper or put it in little candy cups. Then arrange the candies in the box. 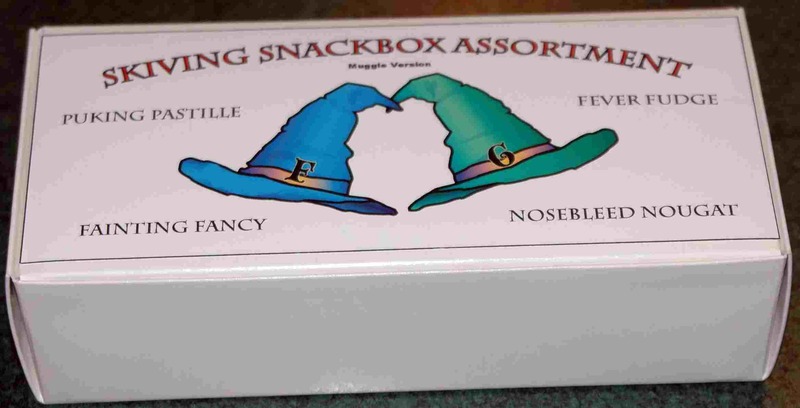 You now have assembled a skiving snackbox that Fred and George would be proud of! © Shelia's tutorial was taken with permission.